Below is a guest post written by a quietly brilliant woman who continues to impress me with her super-human strength and endurance and her capacity to think deeply and love strongly. As an inspiration to all of us, she has recounted her journey towards a life goal of running a sub-three hour marathon, a feat which puts her in a small class of elite runners. Her achievement is only more impressive when you consider that she is a working mom of two little ones, and that her training often happened from 4:30 to 6:30 in the morning. She is a testament to what you can achieve with hard work, dedication, and the unflagging support of family and friends. Guest Post Author (left). The Smile Says it All. In our 30s and 40s, it’s easy to lose ourselves a little bit in the everyday grind and begin to drift, mentally and physically, from the people we were before we married and had kids. So, after almost ten years of not running very consistently or seriously, I began running again. Slowly at first, but then gradually faster. I discovered that while the stretch marks weren’t going anywhere, I sure as hell was, and at a pace much faster, sustained at distances much farther than I ever would have imagined possible. 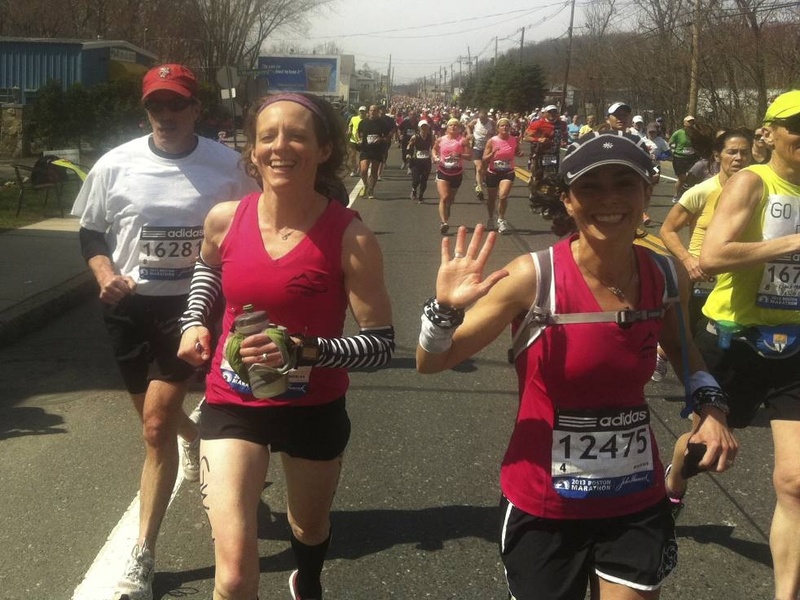 I began to believe, wholeheartedly, that I could run a 2:55 marathon. With that goal in mind, I hunkered down, hired a coach, picked a race, trained for it and in April of 2012 finished the Eugene Marathon with an official time of 2:54:59. Is that a neat and tidy story or what?!? Don’t be fooled—there’s plenty I’m omitting in order to keep it simple. No story, person, or training is ever perfect, but I’ll spare you the messy details and just say that on that day in April, everything conspired in my favor. The weather was ideal, I was healthy, uninjured, well-loved and supported by my husband, family, and friends and was able to reach my goal. So, how did I do it and, more importantly, how can you do it too? My advice in a nutshell: Put a stake in the ground (and set a goal), get used to being comfortably uncomfortable, find a friend or two to run with, stay in touch with your inner slacker, and then just go for it. For starters, this helps with the middle age drift. There is nothing worse than living in a world of unrealized potential. It’s demoralizing to think of all the great things you shoulda, coulda, woulda done. So just start moving your body. Enter some races and begin to gather the resources you need to work towards your goal. For me this meant running a couple half marathons to build some momentum and confidence. I also found a great coach (Tim Gibbons timothypgibbons@yahoo.com) who wrote a training plan for me and then I picked up a GPS watch with a heart rate monitor and some headphones. As a runner who prided herself in pulling on her sneakers and heading out the door, I had been shamelessly corrupted, but no regrets. Running to music is a blast. When you decide on a goal, shout it from a mountaintop. Let the world know. This makes you vulnerable, but means you’ll have a larger cheering section throughout the training process and on the day of the race. If you succeed, people will be thrilled and happy to have been a part of things along the way. If you fail, they’ll still love you…maybe even more so. I’ve decided recently that if I want to continue to grow in this lifetime, I need to get comfortable feeling uncomfortable. No standing still. Movement is life and lactate threshold workouts seem to be the key to getting stronger and faster. I didn’t know what these were until I started working with Tim, but, basically, they mean running at 80% effort for multiple intervals. They mean hunkering down and finding a pace that’s comfortably uncomfortable, one that you can sustain, but don’t really want to and then you make yourself sustain it anyway, becoming a better, stronger, faster woman for it. You can cover so much ground—literally and figuratively—on a run with a good friend. Maybe it’s the routine of weekly time together or the pounding on pavement side by side, but we can figure out a lot on a run from marriages, mothering, our own parents and ourselves. We cry over biopsies and taking steps we never thought possible. One of my favorite running friends was diagnosed with Parkinson’s last fall. We ran Boston together this spring. Another close running friend encourages me to be the best version of myself and keeps me connected to moments of grace. Without them, my life and training would be emptier and less fulfilling. I take two days ENTIRELY off a week and delight in running slowly on my “easy” days. I’m convinced this is why my body doesn’t shatter or fray or fall apart. I come close enough and use buckets of ice to keep injuries at bay, but that’s as far as I go. I’m in my body for the long-haul which means no starving it, no cortisone injections, no ignoring the signs that I might be overtraining and need more rest. This is the best, hardest, and most important part. When it comes to PRs and goals and all that, it comes down to the relationship between your mind and body. Our bodies define us, but so do our beliefs about ourselves. They determine what we can and cannot do. So train your mind and body to work together and try not to take either too seriously. Can you have fun while in pain? Discover the sweet suffering that can lead to a PR? I think so. On the good days, I feel like I’m flying. You should give it a try. This is awesome. She is awesome. I love all five points...esp #2 as it relates to both training + life. Thanks for finding + sharing this story.